The euro crisis is still hot. 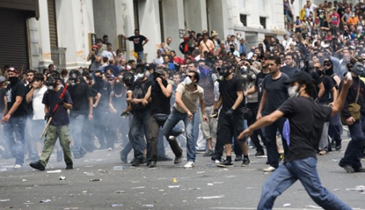 There are riots on the streets of Athens. No part of the political progress is happening without hysterics and plot twists. Yet this is all a side show. The latest Greek bail-out agreement may have gone into the wee small hours, yet it was a non-event as far as the currency markets were concerned. It seems intuitively wrong and, in a way heartless to say this, but the evidence is obvious and conclusive — the euro hasn’t budged for weeks. Whether China is supporting the euro or not, and despite historic cinemas getting torched in Greece, the euro is still stable. My favourite investment advice is to ask a trader, “is the price going up or down?” That is to say, what is the price action telling you about all those investors, small and large, and their take on the situation? You might not have information coming out of European conferences, but you can bet your life all the major players do. The price of the euro is telling you that the Greek situation is a side show. Is Greece going to default? The market says it either knows it won’t or, it doesn’t care. The real issue for the markets was the possibility a problem in Greece would bring down Europe’s banks in a credit freeze, causing a domino effect. This outcome has been fixed, with both the US Federal Reserve and the European Central Bank effectively back- stopping institutions with “no questions asked” loan liquidity. Gone are the days when cash-strapped banks had to be nationalised because they were out of cash, now they just ask for more liquidity from the Central Bank and get it. They have become the conduit for the economic re-inflation that is the road ahead for Europe and the US. The current strategy for economic rescue is to lend back money for nothing. The banks then lend that money to governments by buying bonds, which keeps interest rates low. Low interest rates mean governments can sustain their titanic borrowings. The banks could use some of this money to lend to businesses and consumers. Doing so would boost investment and consumer spending. Increased money supply creates a comfortable level of inflation to erode debts and boost incomes. “Austerity” keeps inflation from running away and, if it’s more than a propaganda campaign to keep the public sector in check, it actually helps rebalance the budget too. The hitches are that banks don’t want to lend to business and consumers as much as they do to their risk-free governments. After all, how many times do they need to be told not to take stupid risks in an attempt to make big bucks? It’s much better to lend money back to governments by buying their bonds. With huge amounts of money circulating, it starts to seep into the economy; in the US this appears to be having a positive impact. This should mean we are in line for a rally. The initial part of 2012 has seen a very strong equity rally, which predicts much improved times ahead. In due course, the issue will be of inflation control and whether Europe and the US can keep inflation below 10 per cent, ideally between five and seven per cent? If possible, it will reset the debt mountain that has built up in the last few years. Gold is the thermometer necessary to see if this has worked. Gold is the market indicator of where inflation is headed. If gold stays under US$2000 an ounce you can expect inflation will be tame. If it rises over US$2,000 and stays below US$3000 then you can expect the US and euro to be on target for high but sub 10 per cent inflation. If gold goes mad you can be sure that the global economy will enter a ‘runaway’ period. Europe’s blueprint is the UK. The continent is set to follow this blueprint more aggressively after the French and German elections are over. The US will follow the very same course once their election is over, too. While we are absorbed by the headlines, the real news will be the individual directions of the US Dollar, Euro, Yen, Pound and Gold. Just like the canary in the coal mine, the yellow metal will be early warning of things to come. Visit ADVFN.com for free, real-time stock prices.